Get low-cost, organic produce twice a week at the Produce Pop-Up. The Produce Pop-Up opens for fall quarter on Tuesday, October 16, featuring seasonal organic produce from the UCSC Farm and other local organic farms. 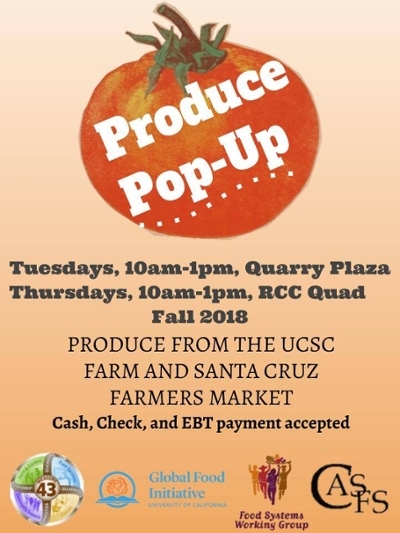 Pop-Ups will take place twice weekly, from 10 am - 1 pm on Tuesdays at Quarry Plaza, and 10 am - 1 pm on Thursdays in the quad at Rachel Carson College. The Pop-Ups are part of a broad effort to provide low-cost and free healthy, organic food to students at UC Santa Cruz. Other resources include the new non-cash Cowell Coffee Shop, campus food pantries, the Swipes for Slugs program, and CalFresh enrollment efforts. Find out about these programs and more at the Basic Needs website.